iMessage is a popular messaging app exclusively for iOS and Mac OS users. With using the app on their mobile, people also want to use it on the big screen that is online. It is not always convenient to use the app on mobile, and it is easy to type on a big keyboard instead of a small one. So how to use it iMessage online? Here is the answer, just read the article and find a different method for it. How to Access iMessage Online? Step 1: Open a browser on your Mac OS and go to the iTunes website. Step 2: In the search bar, type ‘iMessage’ and press enter. Step 3: Now, install iMessage app on your Mac device. Step 4: Now, you have to log in with existing your Apple ID and password. 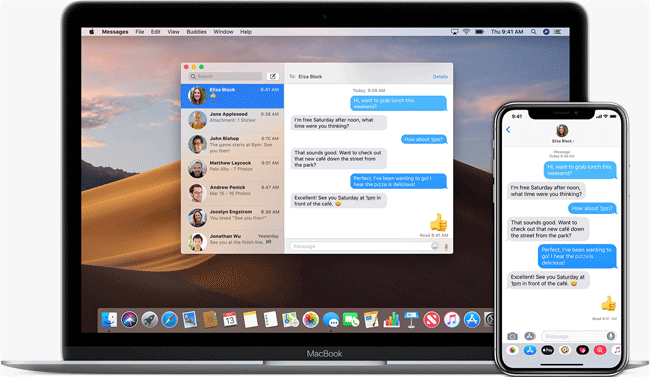 So it is all about the steps you have to follow to use iMessage online on Mac pc. In case you are already using iMessage on Mac, then you do not have to sign in again with Apple credentials. There are two methods to access iMessage online. But note that it is not available for windows officially. To get it, we have to go out of the path and try some different way to get access to the Mac OS or iOS system on the Windows PC. It will allow us to access everything that iOS device offer. So take a look at the first method that is using an android emulator. There are many android emulators like Bluestacks, but here we use iPadian for getting iMessage on PC. Our team tests it and keep your pc safe. So the steps are here to get online iMessage using iPadian. Step 2: Now, launch the app after the installation completes. Step 3: As you open it, your windows screen looks like Mac OS, and you can see the signature Mac dock at the bottom. Step 4: Find the search icon and click on it. Step 5: In the search bar type ‘iMessage’ and install it on PC with an iPadian emulator. Step 6: Launch iMessage and log in with your existing Apple ID and password. All done. Now you can use iMessage online on your PC. Keep in mind that you have downloaded the app through the iPadian, and hence you can download it from the desktop only. Each time when you want to use the iMessage, you have to launch the iPadian. With this method, you do not need to install any android emulator. You can use it online with easy steps, but you need a Mac device. The Mac can be used as the base computer to launch or run iMessage. With chrome remote desktop, you can mirror the screen of Mac on your windows pc or laptop. So you need google chrome on both pc that is on windows as well as on mac. And yes, you need both computers to use this method. Log in to the iMessage on your mac with existing Apple ID and password and follow the steps given here. Step 1: Download and install Chrome browser on both pc. Step 2: Now, launch the Chrome browser on both pc and click on the menu option. You can find it at the upper right corner with three verticle dots. Step 3: Here, a drop-down menu will open, click on the more tools. Step 4: It will open a new menu, choose extension from it. Step 5: A page of the extension will open, click on the left side of the page where you can see the title of Extension. Step 6: Again, you can see a new menu on the left side, go to the bottom of the menu and click on the open chrome web store. Step 7: Search for ‘Chrome Remote Desktop’ and install it on both computers. Now it’s time to setup iMessage online. Step 1: On your Mac computer>> go to Chrome>> menu >> more tools>> Extensions. Step 2: Find ‘Chrome Remote Desktop’ and enable it. Step 3: Click on the Remote desktop icon, located next to address bar. Step 4: Note down the code generate by remote desktop extension. Step 5: Open the pc again follow step number 1 to 3 as it is and connect windows pc remotely with code. Now, you can access the Mac OS on your pc. Enjoy it. It is all about iMessage for PC online on Mac and windows. The process of each method is easy straightforward. You can do it easily without any technical expertise. What do you think? And how’s your experience was? Share using the comment box below.